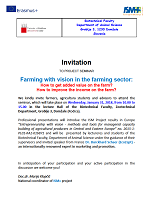 MULTILPIER EVENTS – SEMINAR IN SLOVENIA “Entrepreneurship with vision in the farming sector” – 31.01.2018 by Biotechnical Faculty, University of Ljubljana in cooperation with Slovenian Holstein Association – Entrepreneurship with vision! The seminar was organized in Domžale by Department of Animal Science – Biotechnical Faculty, University of Ljubljana in cooperation with Slovenian Holstein Association. More than 120 participants (farmers, young farmers, students, advisers, veterinarians, journalists) participated to this one day seminar. The seminar was held in Slovenian language (mostly) and in English language with translation to Slovenian language (presentation of invited speaker Dr Burkhard Schaer). Seminar was very intensive with very good discussion and many questions from participants – especially about ISM+ project results and marketing strategies on the farm. In our country farmers tried to create added value with selling of their products directly on the farm or on local market. Knowledge and experiences from invited speaker Dr Burkhard Schaer were very much appreciated from participants. During the seminar, participants received also ISM+ project materials and information about using of ISM tool. Many farmers and advisers (especially from Slovenian Beekeeping Association) expressed interest for future ISM training.